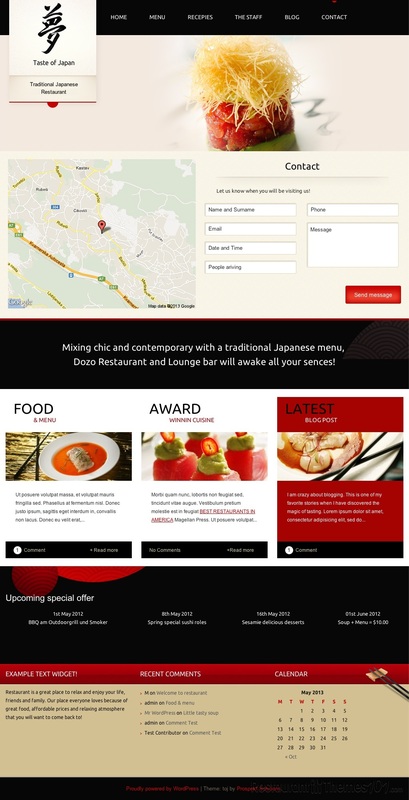 Taste of Japan is a Japanese restaurant theme for WordPress presented on ThemeForest and created by Prospekt Design. 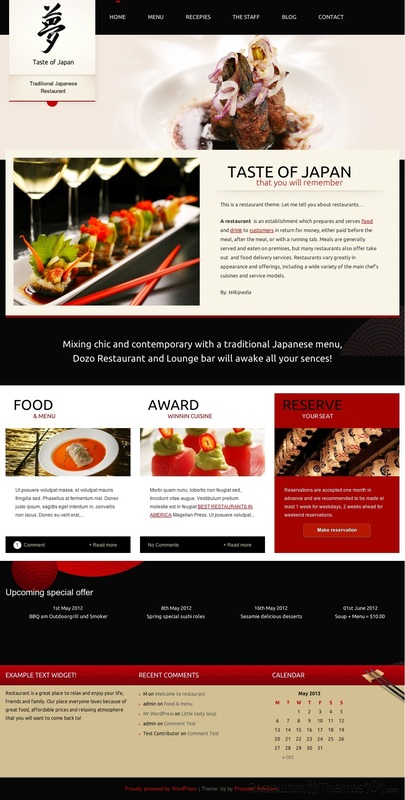 If you own a sushi restaurant, you can’t just pick any theme to go with your website, you will surely need a WordPress restaurant template, and if possible, one that is specially designed for restaurants with Japanese food. This theme is feature rich and it is very professionally designed. Each page of this theme has its own unique layout in order to enhance the attractiveness of your website. 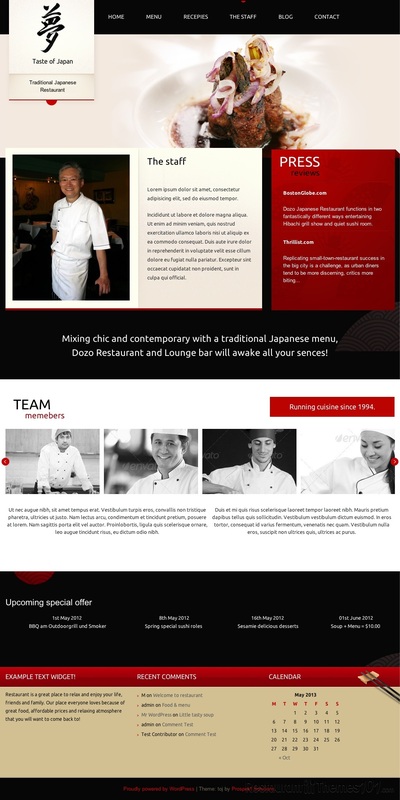 It is very modern looking and yet it has that feel any Japanese restaurant website should have. You can’t have a good Japanese restaurant website without that specific vibe, and this theme provides it. The design of the theme is very creative and clean and it is built to provide your visitors with a great insight of your meals and your whole restaurant. Creating and categorizing your food menu is outstandingly easy with this theme, and most importantly – your menu will look great without you having to break a sweat over categories and listings. You can create a menu with full recipes and all of this is enabled for you through a great administrative system that makes everything so easy. Taste of Japan is very optimized for any search engine and the whole theme was created in a way that makes it very easy for you to add as much content as you need to, and to change it whenever you want to so it represents your business in the best possible way. Taste of Japan features a handy contact form and a nice way of showing your opening. It also includes PSD files to modify the design, and it has some features that are necessary for restaurant websites, including the reservation form that will allow your visitors to book a table with just few clicks. 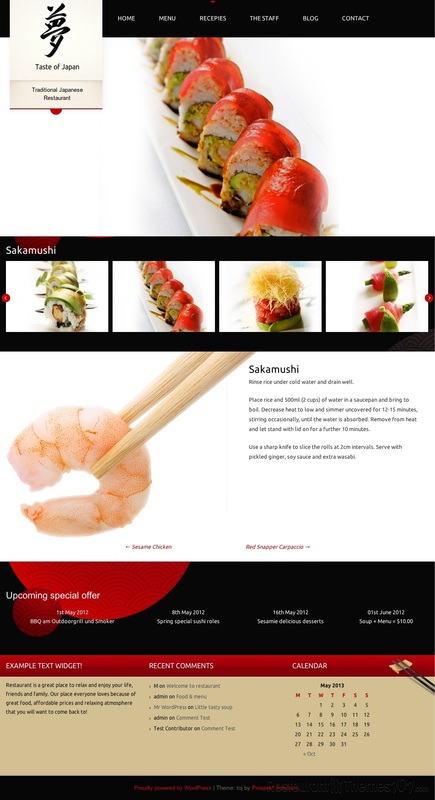 Besides this WordPress theme you can buy Taste of Japan also as a HTML template.